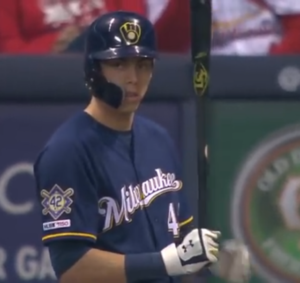 (Milwaukee, WI) — Christian Yelich belted three home runs and drove in seven runs as the Brewers outslugged the Cardinals 10-7 in Milwaukee. Paul Goldschmidt, Paul DeJong and Marcell Ozuna homered for St. Louis, which dropped to 9-and-7. Mike Mayers took the loss after allowing three runs in less than an inning of relief. Game two of the series is tonight with Jack Flaherty opposing Milwaukee’s Brandon Woodruff. (Chicago, IL) — The Royals bullpen failed again. Wellington Castillo hit a two-run homer in the eighth inning off Brad Boxberger to rally the White Sox to a 5-4 win over the Royals in Chicago. Boxberger is 0-and-3 with two blown saves and a 9.72 ERA in nine appearances. Chris Owings and Hunter Dozier homered in the Kansas City three-run second inning. Billy Hamilton returned to the Kansas City lineup after missing three games with a knee bruise and walked, stole a base and scored a run. The loss snapped the Royals’ season-best three-game winning streak. (Miami, FL) — Willson Contreras homered and plated three runs in the Cubs’ 7-2 win over the Marlins in Miami. David Bote had a two-run double for Chicago, which has won three-of-four. Yu Darvish earned the win by striking out eight over five-and-two-thirds innings of four-hit, two-run ball. José Quintana takes the mound tonight against Miami’s Pablo López. (Seattle, WA) — The Cleveland Indians held off a late inning rally by the Mariners to take game one of their three-game series 6-4 in Seattle. After Cleveland jumped out to a 5-1 lead, former Indian Edwin Encarnacion hit a two-run home run in the bottom of the eighth to spark a rally which brought Seattle to within one. The Indians got an insurance run in the ninth before Tribe closer Brad Hand shutdown the Mariners one-two-three to earn the save. Cleveland third baseman hit his first home run of the year for the Indians who will return to action tonight with Seattle at T-Mobile Park. (Los Angeles, CA) — The Los Angeles Dodgers got a two-run ninth inning home run from Joc Pederson to seal a walk-off 4-3 victory over the Reds at Dodger Stadium. Yasiel Puig hit a two-run home run in the first inning off Dodger starter Clayton Kershaw in his first game back in LA since being traded to Cincinnati. With the game tied at two, Matt Kemp singled in a run in the top of the ninth to give the Reds the lead but closer Raisel Iglesias walked the first batter he faced before Pederson’s game-winning homer. The teams will play again tonight in Los Angeles with Tyler Mahle on the hill for Cincy.